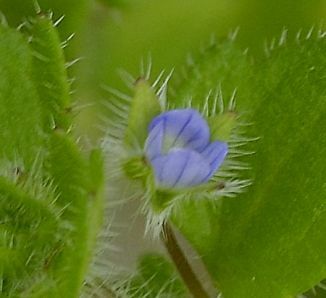 Ivy-leaved Speedwell is not easily confused with other wild plants on this web site. 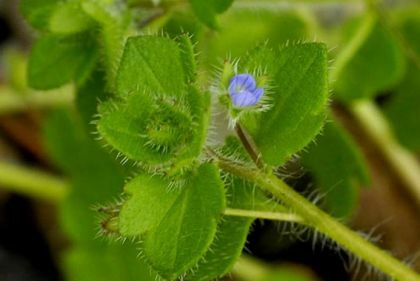 Among the Speedwells which are frequently found growing in Ireland, this plant differs from others by the shape of its leaves which are broader than long. Found on bare and cultivated ground, this prostrate annual has trailing stems and distinctive leaves which are kidney-shaped and lobed in a way which resembles ivy leaves. The plant is extremely hairy, even on the margins of the calyx. The pale blue – sometimes white - solitary flowers (4-5mm across) have four veined lobes and are borne on short stalks which arise from the leaf axils. They bloom from April to June. A member of the Plantaginaceae family, this plant is thought to be an introduction. My first record of this wildflower is in Dalkey, Co Dublin in 1977 and I photographed it in Gibletstown, Co Wexford in 2006.